As designated by the U.S. Treasury, there are 8,700 Opportunity Zones in the United States. Typically, these zones are neighborhoods with an average population of 4,000 people that have remained economically depressed over time. Average unemployment is over 14% and nearly 40% of prime age adults remain out of the workforce. Median household income is lower than the U.S. average and homes are twice as likely to be located in a census tract where 20% of the population has been living below the poverty line for 30 years. It’s not a pretty picture, but these Opportunity Zones can offer excellent investment opportunities and big bottom line benefits for business. Specifically, we’re talking about generous tax incentives, including the waiver of federal capital gains taxes. Opportunity Zones were created by the Federal Tax Cut and Jobs Act of 2017. They’re designed specifically to stimulate private, long‐term investment in economically distressed areas. The program is scheduled to be active for ten years starting in 2017. 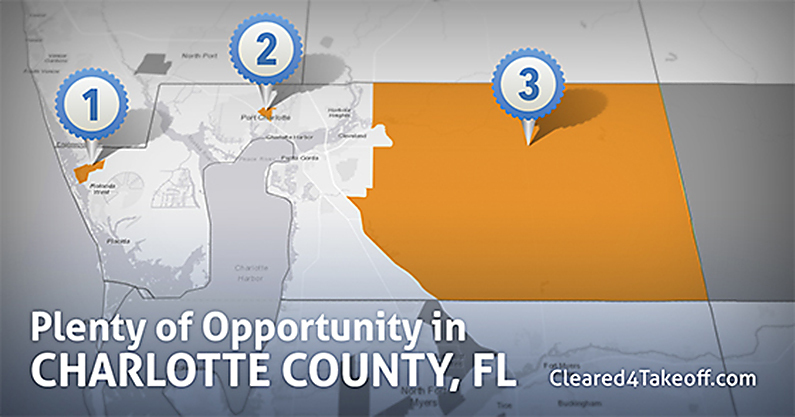 Charlotte County has three certified Opportunity Zones that qualify for federal corporate tax incentives. The three Zones include a large area east of Punta Gorda; a smaller tract north of Charlotte Harbor; and a comparable small tract bordering the Gulf. Think your company can benefit by locating in an Opportunity Zone? Here’s some drill-down information to consider. By definition, Opportunity Funds allow investors and investing companies to defer and reduce the amount of tax they owe on capital gains. The Tax Cuts and Jobs Act of 2017 contains five core principles: 1. Opportunity Funds must hold 90% of assets in designated Opportunity Zone properties or businesses. 2. Purchased properties must be improved. 3. Investments in a business require the purchase of stock or a partnership (loans are not valid). 4. Investments may be combined with other tax-advantaged vehicles such as the Low Income Housing Tax Credit. 5. Investments may be made in any Opportunity Zone in the U.S. and/or in multiple zones. To explore qualified sites and properties for Opportunity Zone investments, talk to the Charlotte County Economic Development Office. Interest in this program has been strong across the country, so it could be smart to be an early bird.